We’re going to work a bit of the same sort of magic with “O Little Town of Bethlehem,” written by American Episcopalian priest Phillips Brooks (inspired by his 1865 visit to the fabled city) and his church’s organist, Lewis Redner. For the most part, we’ll use either pairs of notes of chord arpeggios to create our arrangement of this beautiful carol. Even though the first set of notes is based on an open position D chord, it’s a good idea to fret the high E (first) string with your ring finger and the G string with your middle finger. In fact, you want to use your middle finger as a bit of an anchor during the most of the instances where you’re playing two notes at the same time. If you use your middle finger on the G or D string, that frees you up to use your ring finger whenever the high note is on the same fret and to use your index finger when the high note is one fret lower, as in the second pair of notes in the second full measure. The third measure demonstrates why this use of the middle finger as anchor can be so helpful. If your first inclination is to use your index and middle fingers for the pair of notes on the second fret of the B and D strings, then you’d find it more than a little awkward making any sort of smooth transition to the two subsequent pairs. But keeping your middle finger on the D string allows you to quickly move from pair to pair. By the bye, you definitely want to finger a “normal” open position D chord at the start of the last measure in this example! The first two measures of Example 2 are the trickiest part of our song. Use your index finger to barre the first five strings at the fifth fret and your ring finger to barre the first four strings at the seventh. This will allow you to play the first two eighth notes and the following quarter note (where the B and G strings are played at the seventh fret). In 1865, the year the Civil War ended and President Lincoln was assassinated, an American priest named Phillips Brooks traveled to Israel. On Christmas Eve that year he rode on horseback through the fields around Bethlehem and attended the Church of the Nativity. His visit inspired him to write a poem for his Sunday School students at the Church of the Holy Trinity in Philadelphia. He had the church organist, Louis Redner, set the poem to music. 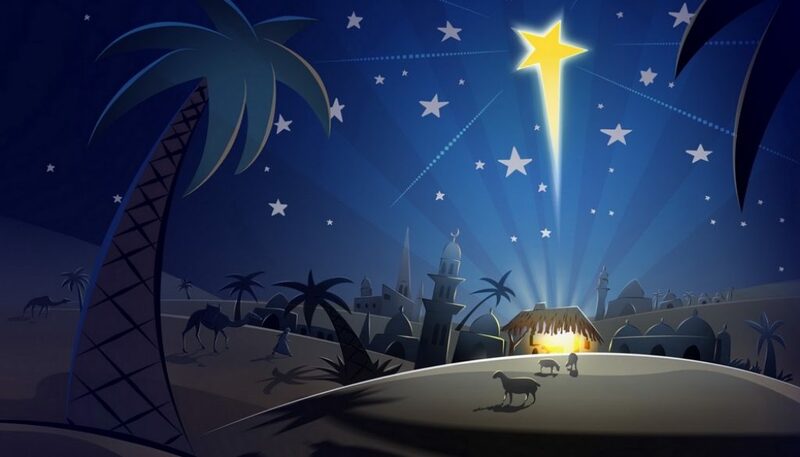 “O Little Town of Bethlehem” was first sung at the Sunday school service on December 27, 1868. Then stand your ring finger up on its tip on the seventh fret of the D string. Use your middle finger to play the sixth fret of the A string and your pinky to get the seventh fret of the high E (first) string. Lift up your pinky and your index finger will have the two notes at the fifth fret (on the high E and G strings) that you need to close the measure. You’re still not out of the woods, though! You next need to make a bit of a leap to place your index finger on the second fret of the D string and to put your pinky on the fifth fret of the high E. This takes a bit of practice but it’s not as hard as it sounds. You could, as an alternative, play the E note (second fret of the D) at the seventh fret of the A string and the G note (third fret of the high E) at the eighth fret of the B string. That’s a lot fewer gymnastics for your fingers but you’re still going to have to jump down the neck for the G in the bass (third fret of the low E string) at some point. I’ve tried it both ways and find myself preferring the former. You may find otherwise, though, so be sure to experiment. The final two measures in this example are more chances to use your middle finger anchor when playing. If you thought you were getting good at it earlier, now’s your chance to find out for sure! And, like the first line, you want to finish this section off with an open position D chord. It’s a good idea here to use your ring finger to get the E note (second fret of the D string) when you play the third chord (Em) and then slide it up the D string for each of the following two chords. You should end up starting the second measure with your ring finger at the fourth fret of the D string, your middle finger on the third fret of the G and your index finger at the second fret of the B string. This is an F# chord, by the way. For the second F# Lay your index finger flat across the second fret to make a barre chord out of it and get you the F# in the bass (second fret of the low E string). You’ll revisit this F# barre in the last measure of this example. Try to get the G note in the bass in the second measure with your index finger. This will make the next pair of notes (seventh fret of the high E and the fourth fret of the low E) a lot easier to manage! As always, here, is a full version for you to work with. And (again, as always) please forgive any of the numerous performance mistakes! I hope that you’ve enjoyed this arrangement of “O Little Town of Bethlehem” and that you find it a great Christmas present for both you and your family and friends. And let me take a moment to wish all our readers, their family and friends, a wonderful holiday season. We thank you for your continued support of Guitar Noise and look forward to bringing lots of great lessons in the new year!